Habitat loss and fragmentation due to urbanisation and road developments have considerable negative impacts on amphibian populations. However, little research has examined the effectiveness of amphibian mitigation road tunnels. 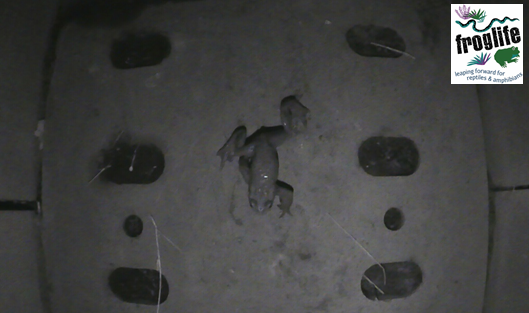 In this unique study we used specially adapted time-lapse recording cameras and a custom image analysis script to monitor the amphibian usage and effectiveness of tunnels at a site in northern England over 4 years. Example of an entrance to an ACO tunnel. Note: this was taken at a different site in the UK since the study site remains anonymous. We monitored four amphibian species, including the European protected great crested newt (Triturus cristatus). 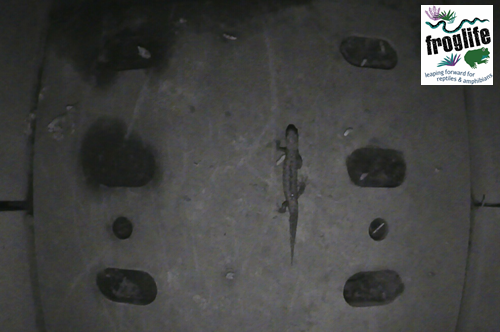 Our results show that most amphibians entering tunnels successfully used them to move between the different parts of the site separated by the road. The local population of newts increased rapidly over the 4-year study period, suggesting that the provision of tunnels, along with suitable pond and terrestrial habitats, have successfully promoted population growth. We found that newts mainly used tunnels in the autumn, rather than the spring, by both adults and juveniles for dispersal. This indicates it is extremely important that road tunnels connect suitable pond habitats on both sides of the road as opposed to terrestrial habitat on one side and aquatic habitat on the other side. Great Crested Newt entering a tunnel during autumn dispersal. 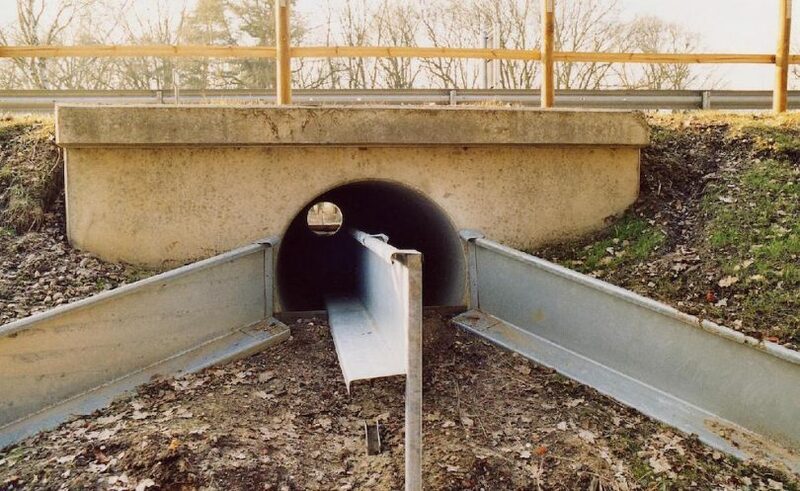 The proportion of individuals from different species successfully completing full tunnel crossings varied considerably with season, year and species, indicating that local factors can play a large role in the success of tunnels. There was little effect of temperature and rainfall on the activity levels of amphibians which suggests that several factors may be important in determining the usage of tunnels by these species. By the time amphibians have started their migration, temperature and rainfall may have less of an effect as long as extremes are avoided. The peak movement times for great crested newts in tunnels were between 18:00 and 05:00 with negligible activity during the day. By contrast, smooth newts were equally active through a given 24-hour period. Repeated pond surveys and occupancy analysis estimates showed a rapid increase in peak counts of great crested newts in ponds close to the tunnels and the population estimate of this species increased from 59 in 2014 to 300 in 2017. Overall our results show that when amphibian mitigation road tunnels are installed close to ponds, with effective drift fences, additional ponds and suitable terrestrial habitat, that amphibian populations can be maintained and enhanced by movements through tunnels. Common toad exiting a tunnel after spring breeding. 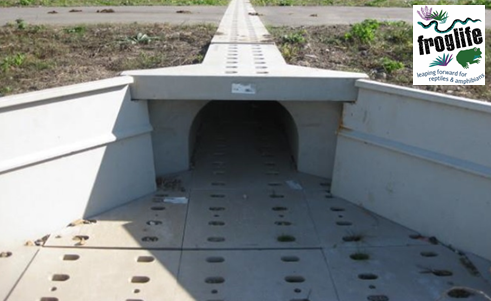 Header image: A “tunnel” below a street to prevent migrating amphibians (e.g. toads like Bufo bufo) from being killed. Photo made in northern Germany in March 2003. Credit: Christian Fischer/Wikimedia Commons. First posted on www.froglife.org on 27 February 2019.